The full-service Recreation Center & Clubhouse complex features a Jr. Olympic swimming pool and a rock fountain at the children’s wading pool against a backdrop of either palm trees or native trees. The luxury clubhouse has a spacious gathering room with wood-burning fireplace and comfortable furniture for watching the wide-screen television with DVD player –a standard in Canyon Gate clubhouses. A fully-equipped kitchen has an outdoor service window that opens to the pool area. Also, in the clubhouse is an exercise equipment room for residents only. 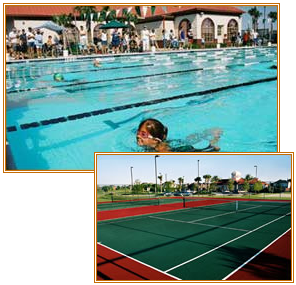 Outside is a covered and lighted basketball pavilion, lighted tennis courts, and a sand volleyball court. The complex also has a children's playground area, with convenient park benches. This 5-acre water park and swimming complex includes both a splash pad and a swimming pool. The splash pad alone has over 6,000-square-feet of playing surface, including water tunnels, geysers and hoops. 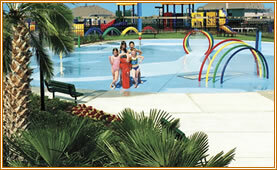 SplashPad Texas at Stone Gate has a family-size playground area, complete with tunnels and climbing equipment. The complex has covered pavilions, picnic tables and benches for resident gatherings. As a member of any of the Canyon Gate family of communities, residents receive discounted green fees and priority tee times at Houston National Golf Club in Stone Gate.